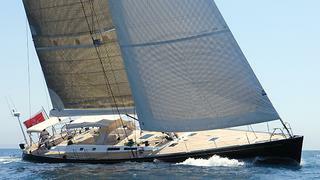 Joost Goverts at Northrop & Johnson in Palma gets in touch to announce a €200,000 price drop on his listing for sale, the 24.9 metre sailing yacht Conquistador. Conquistador was built by Finland's Nautor's Swan yard to a design by German Frers and, Bureau Veritas classed, was delivered in 2001. She has a teak veneer interior with a hand rubbed satin varnish finish and sleeps up to eight guests in a full width owner’s stateroom, a double and a twin cabin, plus two Pullman berths. With her PBO rigging, carbon mast and boom and a 4.5 metre draft, she is a great boat to cruise and race. Under power, a 240hp Yanmar engine gives her a range of 1,600 nautical miles at nine knots. A very extensive refit was carried out at the RMK yard in Turkey between October 2011 and August 2012. The renewal of the teak decks and paint work was contracted to RMK in Turkey while all further upgrades, replacement and refurbishment of systems were carried out by Nautor-trained technicians. Lying in Palma de Mallorca, Spain, Conquistador is down from €2.65 million to €2.45 million with VAT included.